I love chicken…. in my house we have what I call “Chicken Monday” It’s one of the best days of the week for me, a day off of work, and I’m grilling chicken!!! I always grill enough chicken so we have leftovers on Tuesday, maybe chicken Caesar salad, pulled chicken, fajitas, stir-fry… the options are endless!! Interestingly, chickens were first domesticated in India in about 2000 B.C. For the first time in 100 years, chicken is more popular than beef in the U.S. Why?? Beef prices are up, and people are going toward more affordable and health conscious options. Here are some of the most popular types of chickens in the United States. -Stewing hen, an older hen over 10 months old. The meat is tougher than a younger chicken, yet very flavorful. This is best used for making stock, soups, braising, or stewing. -Capon, a neutered male chicken between 6-8 months old and weighs about 6-8 lbs. 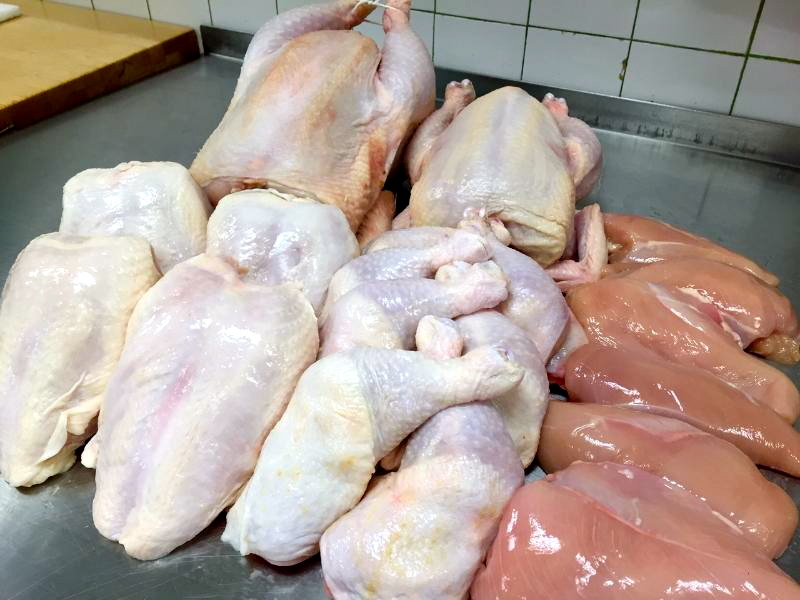 They produce large amount of tender white meat. This is best roasted whole. -Roaster, a young chicken between 8-12 weeks of age, and weighs in at about 4-7lbs. They will yield more meat than a broiler/fryer. They are best roasted whole. -Broiler/fryer is the most popular chicken found in butcher shops and grocery stores. It is a young and tender chicken between 6-10 weeks old and weighs about 3-4 ½ pounds. You can prepare these chickens in any cooking method. -Cornish hen, a small yet tender bird, usually weighs in at about 1-2 lbs. yields more white meat than dark. It’s best roasted whole, serving one per person. Chicken is the most popular type of poultry in the world, and a great source of protein. In America, breast meat is popular because of its low fat content. An average American will buy about 85 lbs. of chicken a year!! Most chickens found at your local butcher shop or grocery stores are inspected by the USDA for “wholesomeness”, and are “Grade A”. This means they are free from visible signs of disease and have good meat to bone ratio; They are clean, with no torn skin, no bruising, no broken bones, or any discoloring. When buying chicken, check for the use-by date. Make sure it feels cold to the touch, and does not have a grey or pasty looking skin. Keep it in its original package until you are ready to use it. When you get home, place it in your refrigerator immediately that is below 40 degrees. Cook it within 1-2 days for best results. When you purchase a whole broiler/fryer it is a better value than just buying individual parts. You can roast it whole, butterfly it, or cut it up in 8-10 pieces. 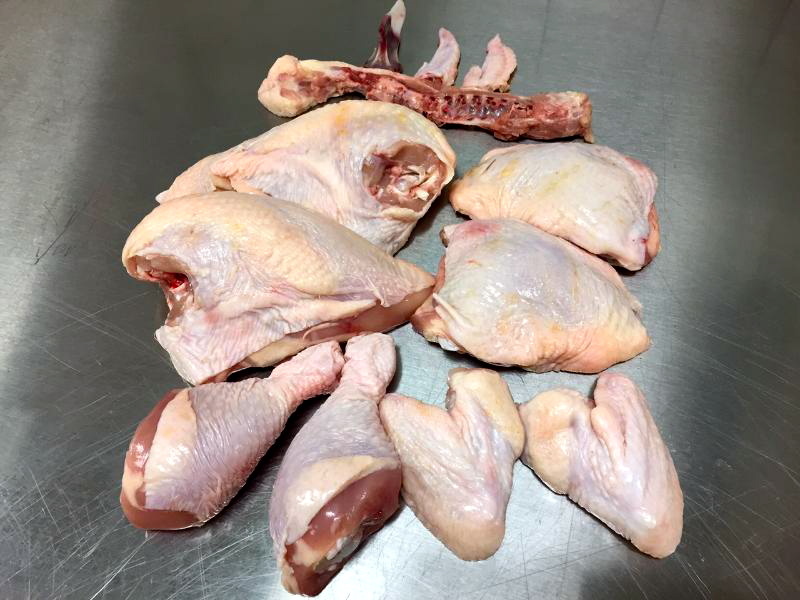 You can save the backbone and wing tips for making stock at a later date. You can do so much with a whole chicken! Start your own day of the week for grilling chicken!! You’ll love it too!